The first settlement in Mesoamerica dates back to 20000 b.C., and more exactly, in Tehuacàn valley: the archaeological finds discovered in this area highlight the detailed devotion to hunting, the sole mean of support for this people till about 7000 b.C., when it’s possible to collocate the beginning of subsistence agriculture. Around 2000 b.C. the objects appear more refined, the first pieces of pottery match with birth of the Olmecs civilization that, in this period, established in corresponding areas of modern Tabasco and Veracruz, and afterwards spread in all Mesoamerica setting up the first urban and ceremonial centres as San Lorenzo and La Venta, and deepening some important cultural aspects as writing and numbering, that affected the development of successive civilizations. Since 700 b.C. in Oaxaca area, under the olmec influence, the Zapotecs civilization grew around their most important ceremonial centre, Monte Albàn, developing writing and introducing the calendar. The 2th century b.C. crowns the birth of Tehuacàn civilization in central Mexico (north-east suburbs of modern Mexico City), that prevailed over Olmecs cities especially in cultural matters and reached its highest magnificence during the “classic” age ( from 3th to 5th century a.C.). This is the classic period also for Maya, a population constituted of various stocks whose origins still closed in the mystery. Since 1500 b.C. settled a large area including the modern Mexican regions of Yucatàn (Uxmal and Chichèn Itzà), Quintana Roo, Campeche, Tabasco and Chiapas (Palenque), besides some Belize areas, Guatemala (Tikàl) and Honduras (Copàn). Maya were affected by the closeness of Olmecs, Zapotecs, and Teotihuacans, giving rise to a prolific sculptural production that ranges from works of small dimensions to imposing staelae. On the other hand Maya gave free play to their artistic vein through wall painting (Bonampàk) and stood out for their scientific talent that led them improving a detailed calendar and a complex and sophisticated hieroglyphic writing of which Popul Vhu, the sacred mayan book describing the religious practices and customs of this people, is a marvellous example. 10th century a.C. marks the decline of Maya civilization, many cities were mysteriously abandoned and others, like Chichèn Itzà and Tula, suffered the territorial expansion of Toltecs, population coming from north particularly devoted to sculpture (war themes and large dimensions works) and metalworking (iron, gold). 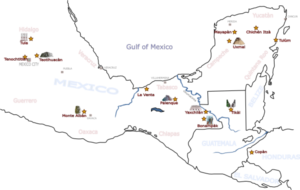 In 1168 the toltec city of Tula fell under the Chichimecs offensive that originated from their capital, Mayapan, and brought them to an alliance with the Yucatàn populations of Uxmàl and Chichèn Itzà. Since 14th century the Aztec ascent, beginning from their first settlement, Texcoco island, came true with the blooming Tenochtitlàn, which temples edificated on artificial hills are almost completely lost. Aztecs weren’t Toltecs descendant but took inspiration from their culture, so death and war became carrying themes of their pictorial sculptural production.